Every really great story begins with a hero who is called upon to make wrongs right, cause good to triumph over evil, and win the day. In the second chapter of Exodus, we are told a birth story about a baby who would be named Moses, which leads us to believe he will be the beloved hero of our story. This Moses was hidden in a basket to escape Pharaoh’s death sentence, only to be found by a daughter of Pharaoh, and then raised as a grandson of Pharaoh himself! So our likely hero Moses has just killed an Egyptian in cold blood! Then, on the next day a fight breaks out between two Hebrews and when Moses tries to intervene, the two Hebrews ask if he is going to kill them like he did the Egyptian. At once Moses knew his secret was out, and soon Pharaoh would be after him. So in fear, Moses fled to Midian as a murdering coward, rather than a liberating hero. And at this point, we begin to question whether or not Moses, who just buried an Egyptian in the sand, will ever be the hero Israel so deeply needs. Then, almost all hope is lost as Moses forgets about his enslaved brothers in the land of Egypt, and takes a wife in a new land; a new land where he hopes of settling down and beginning a new life for himself, a life away from the comforts of the palace in Egypt and away from the groans of his Hebrew brothers; a new life where he could forget his past (and also his people). But there was someone else who wouldn’t forget, and who never forgets. And that someone is the true hero of our story, and his name is not Moses. The true hero of our story is not Moses who forgot, but God who remembered. 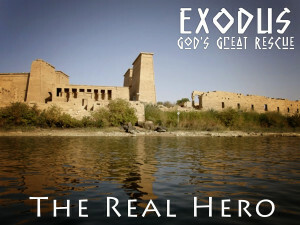 The true hero is God who heard the cries of his people and remembered his great covenant to Abraham, Isaac, and Jacob! Those promises to make them great, give them a land, and use them to bless the whole world. You see while Moses was hiding in Midian, God was seeing his people from heaven, and when God saw his people, he knew. And now the stage is set for our true Hero, who hears, sees, remembers, and knows, to begin the greatest rescue mission the world had ever seen. What about you? Have you forgotten that God hears, sees, remembers, and knows? Have you failed to call out to Him because you forgot that He never forgets? What do you need to cry out to God for this week? Go ahead; He is all ears.